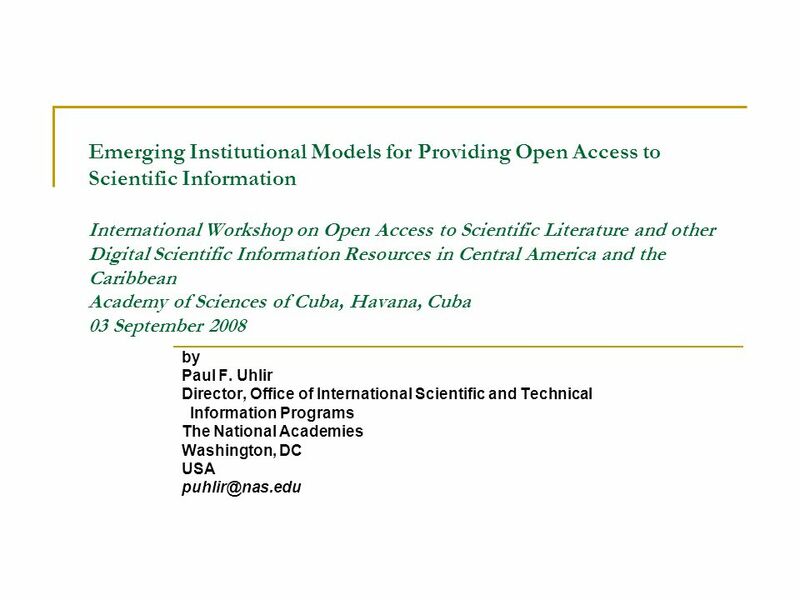 Emerging Institutional Models for Providing Open Access to Scientific Information International Workshop on Open Access to Scientific Literature and other. 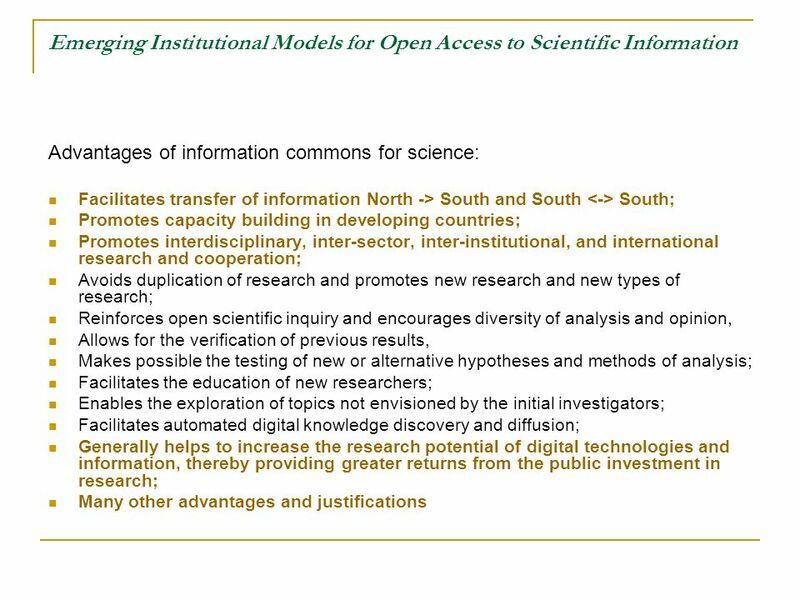 3 Emerging Institutional Models for Open Access to Scientific Information What is an information commons? 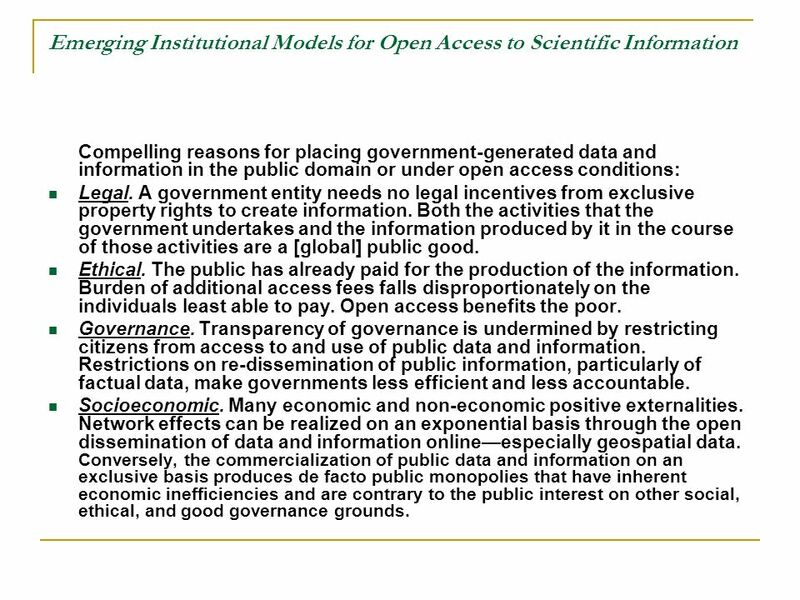 Digital data and information originating principally from government or publicly-funded sources; Made freely available for common use online; With the material in the public domain, or with only some rights reserved (using a common-use licenses, such as Creative Commons), or with full intellectual property rights, but under open availability conditions; and Typically organized thematically through an institutional mechanism. 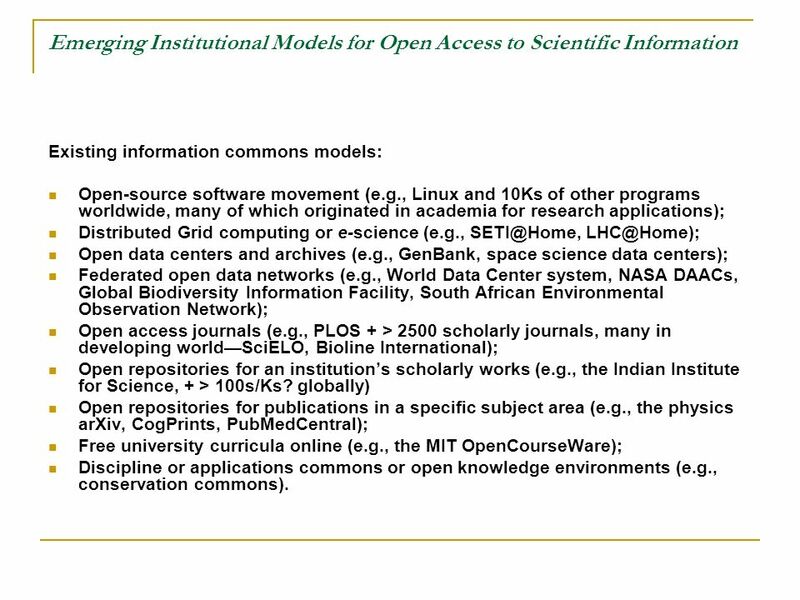 4 Emerging Institutional Models for Open Access to Scientific Information Existing information commons models: Open-source software movement (e.g., Linux and 10Ks of other programs worldwide, many of which originated in academia for research applications); Distributed Grid computing or e-science (e.g., SETI@Home, LHC@Home); Open data centers and archives (e.g., GenBank, space science data centers); Federated open data networks (e.g., World Data Center system, NASA DAACs, Global Biodiversity Information Facility, South African Environmental Observation Network); Open access journals (e.g., PLOS + > 2500 scholarly journals, many in developing world—SciELO, Bioline International); Open repositories for an institution’s scholarly works (e.g., the Indian Institute for Science, + > 100s/Ks? globally) Open repositories for publications in a specific subject area (e.g., the physics arXiv, CogPrints, PubMedCentral); Free university curricula online (e.g., the MIT OpenCourseWare); Discipline or applications commons or open knowledge environments (e.g., conservation commons). 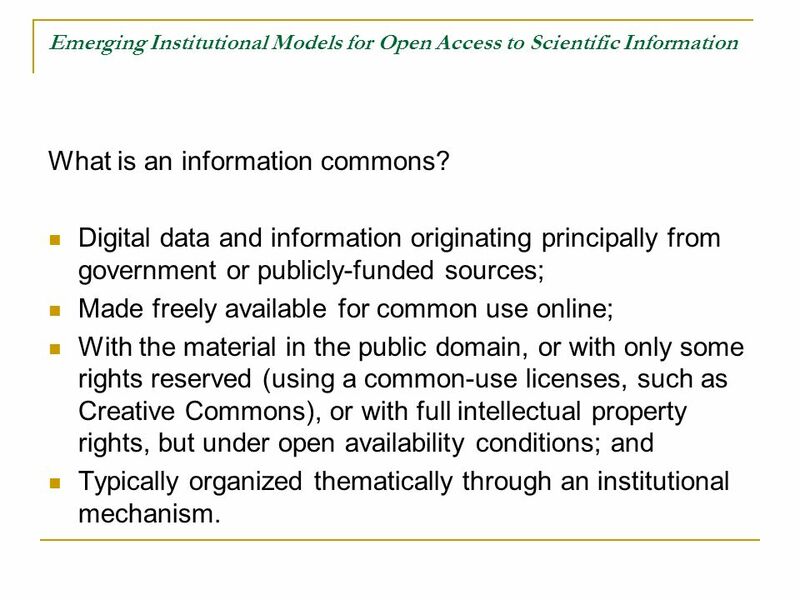 6 Emerging Institutional Models for Open Access to Scientific Information Compelling reasons for placing government-generated data and information in the public domain or under open access conditions: Legal. A government entity needs no legal incentives from exclusive property rights to create information. Both the activities that the government undertakes and the information produced by it in the course of those activities are a [global] public good. Ethical. The public has already paid for the production of the information. Burden of additional access fees falls disproportionately on the individuals least able to pay. Open access benefits the poor. Governance. Transparency of governance is undermined by restricting citizens from access to and use of public data and information. Restrictions on re-dissemination of public information, particularly of factual data, make governments less efficient and less accountable. Socioeconomic. Many economic and non-economic positive externalities. Network effects can be realized on an exponential basis through the open dissemination of data and information online—especially geospatial data. Conversely, the commercialization of public data and information on an exclusive basis produces de facto public monopolies that have inherent economic inefficiencies and are contrary to the public interest on other social, ethical, and good governance grounds. 9 Barriers to creating information commons: Implementation and acceptance of new policy and institutional frameworks. Development of adequate incentives at the individual, community, institutional, and governmental levels. 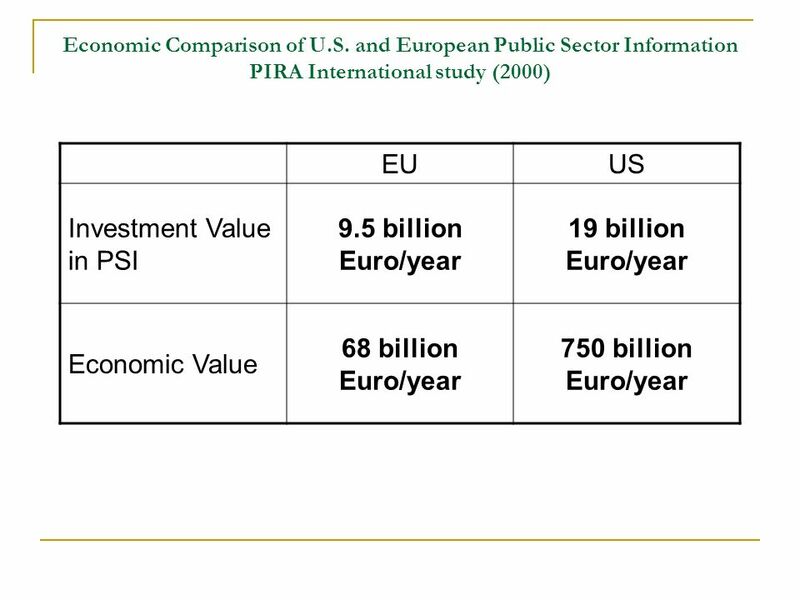 Long-term financial sustainability of different information commons models. Effective technical and organizational approaches. In all cases, must balance with legitimate countervailing values and legal restrictions (protection of national security, privacy, confidentiality, and IPRs). 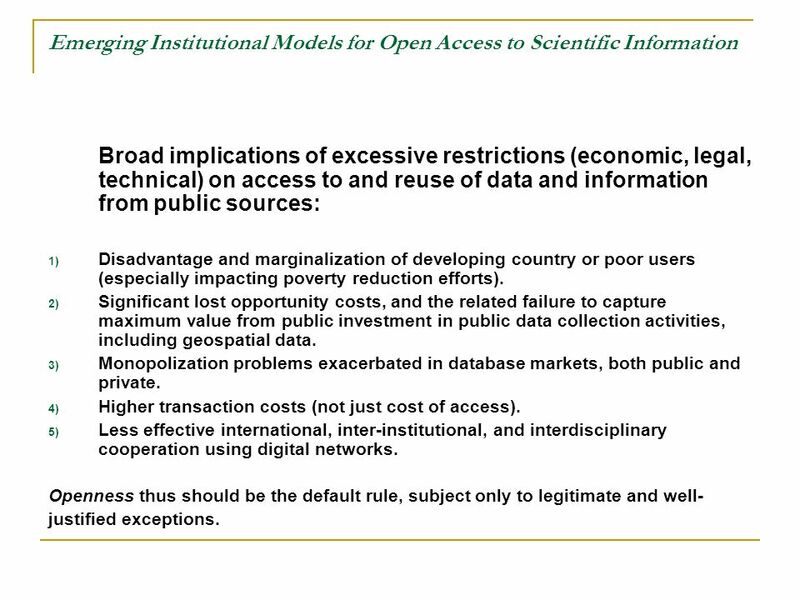 10 Emerging Institutional Models for Open Access to Scientific Information Broad implications of excessive restrictions (economic, legal, technical) on access to and reuse of data and information from public sources: 1) Disadvantage and marginalization of developing country or poor users (especially impacting poverty reduction efforts). 2) Significant lost opportunity costs, and the related failure to capture maximum value from public investment in public data collection activities, including geospatial data. 3) Monopolization problems exacerbated in database markets, both public and private. 4) Higher transaction costs (not just cost of access). 5) Less effective international, inter-institutional, and interdisciplinary cooperation using digital networks. Openness thus should be the default rule, subject only to legitimate and well- justified exceptions. 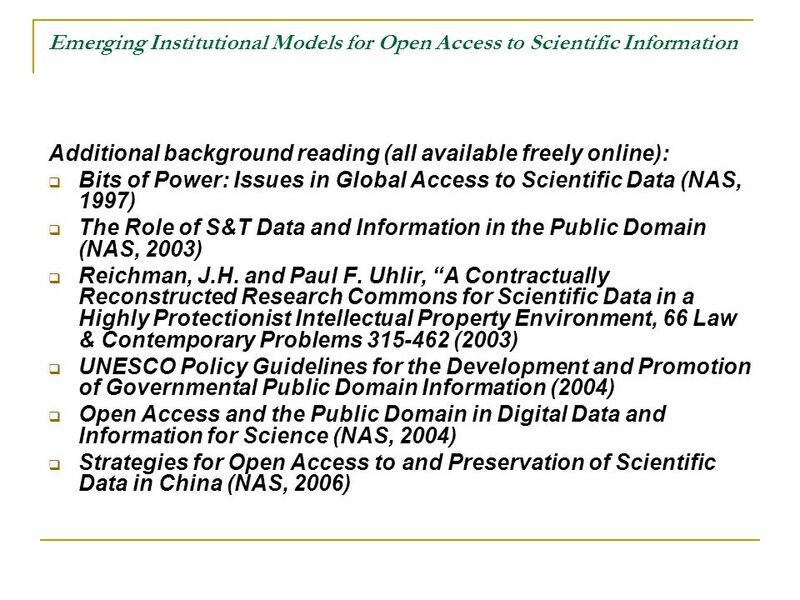 Download ppt "Emerging Institutional Models for Providing Open Access to Scientific Information International Workshop on Open Access to Scientific Literature and other." LAPSI 4th Thematic Seminar Muenster, January 27, 2011 Should the information held by research institutions be included in the EU Directive on PSI Re-use? Open Data for Global Science Developing a Surfers Paradise for Research Data Legal Framework for e-Research Conference Gold Coast, Australia 11 May 2007. DSpace: the MIT Libraries Institutional Repository MacKenzie Smith, MIT EDUCAUSE 2003, November 5 th Copyright MacKenzie Smith, This work is the. 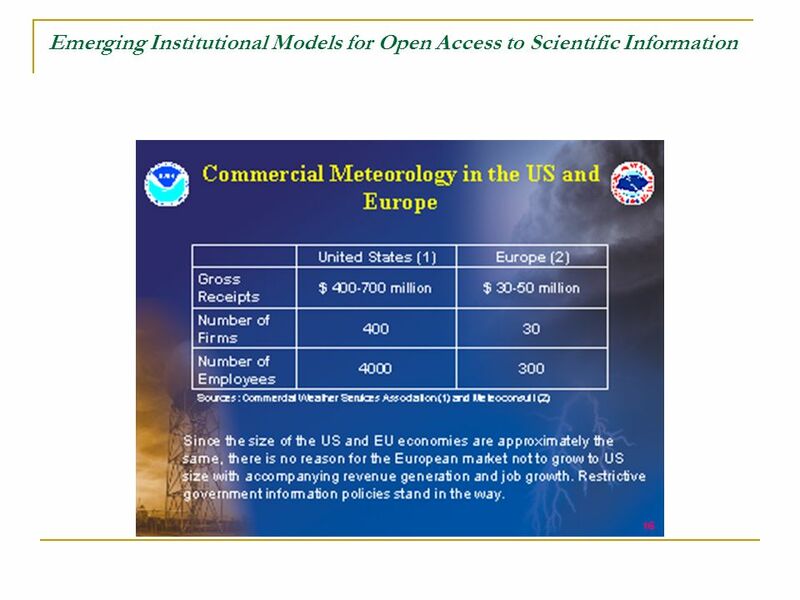 Policy for Publicly Funded Scientific Data in the U.S. Symposium on the Value of Shared Access and Reuse of Publicly Funded Scientific Data 1 December. Joint CASC/CCI Workshop Report Strategic and Tactical Recommendations EDUCAUSE Campus Cyberinfrastructure Working Group Coalition for Academic Scientific. Throwing Open the Doors: Strategies and Implications for Open Access Heather Joseph Executive Director, SPARC October 23, 2009 Educause Live 1. Thematic Breakout Session: Panel 7.2. Environmental & Geospatial Data & Metadata Report by: Raed M. Sharif. 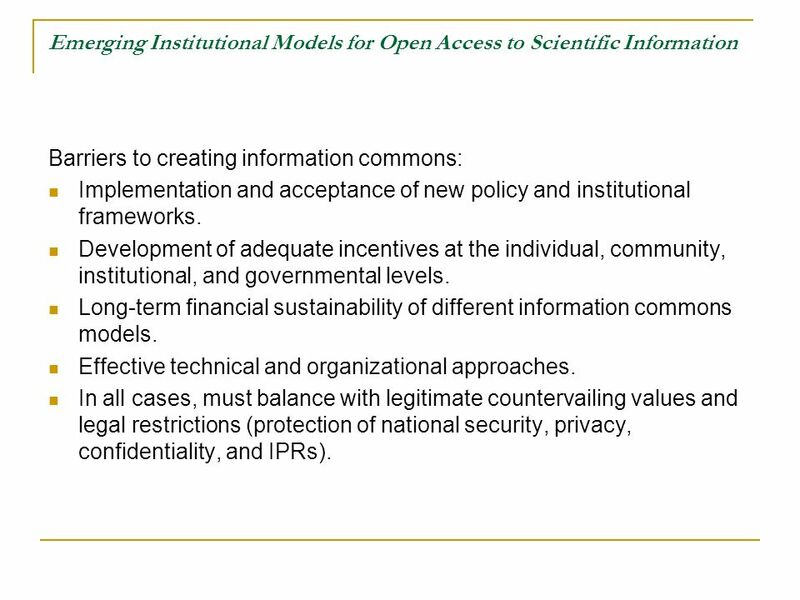 Emerging Institutional Paradigms for Providing Open and Permanent Access to Scientific Data and Information CODATA Workshop on Strategies for Open and. U.S. – China Roundtable on Scientific Data Cooperation and Joint Study on Improving Scientific Data Sharing Paul F. Uhlir, J.D. Director, Board on Research. WIPO’s Strategies on Intellectual Property and Economic Development WIPO’s Strategies on Intellectual Property and Economic Development United Nations. Cooperatives and Youth in the Context of Rural Development Presented at the Seminar Organized by Agri-Seta Prof. Muxe Nkondo National Small Business Advisory. The Impact of Open Source Software on Competition on Software Markets Jens Mundhenke Kiel Institute for World Economics Baltic IT&T 2005 Forum Seminar.